Five acre home sites on 38.7 acre retreat-like nature preserve. Close to Olympia’s west side, and walking distance to The Evergreen State College. In highly desirable Olympia School District. Area now zoned Residential with minimum 5 acre lot sizes. Over eight acres of wooded open space owned in common by the residents. The Cooper Point Nature Preserve is intended primarily as a natural area preserve, but the beautiful property offers the opportunity for a small, loosely affiliated neighborhood of environmental preservation-oriented homeowners to enjoy houses on large individual lots, with the quiet, forested ambience protected by covenants and conservation easements. The preserve is at the northeast corner of 36th Avenue NW and Overhulse Road NW in Thurston County, Washington. With its varied topography, wide range of tree species, and open meadow areas the land is highly attractive. The preserve includes a deep ravine system with a tiny year-round stream and a boggy bottom area, two seasonal ponds of around a half acre each, and a tiny seasonal pond by Overhulse Road. A pair of bald eagles nests in a prominent, tall old growth fir on the adjacent property. Mallard ducks frequent the ponds, and an abundance of other birds, deer, and various smaller wildlife inhabit the land. Occasionally a coyote is sighted. Lots are not listed with realtors, but rather buyers will enter into a purchase agreement after in-person consultations with the current owners to ensure purchasers completely understand, and are in full agreement with, the philosophy of the Cooper Nature Preserve and its covenants and regulations. Homeowners will be members of a Stewardship Association which will supervise use of the land to ensure adherence to the covenants and to the philosophy of preservation of the natural areas. No buyers will be discriminated against on the basis of race, color, religious creed, handicap, ancestry, national origin, age, gender, or sexual orientation. However, land purchases must be for the buyer’s own primary residence to be built within two years (unless extended for good reason), and not primarily for investment. For-profit entities are not eligible for land purchases, nor are purchases by absentee owners. The sellers retain the right to decline any land purchase and are the sole judges of whether prospective homeowners are likely to devotedly care for the natural area preserve and to enthusiastically maintain its character and purposes. LOT 1 – 5.04 acres, $175,000. The quietest, most remote lot — for those who prefer a real retreat setting to “get away from it all” while still being close to the amenities of town. The flat home site area can face south for lots of sun and is adjacent to a seasonal, oval shaped, heavily vegetated pond favored by ducks. The eastern part of the lot falls off steeply into the deep ravine with its boggy wetland and the year round tiny creek which empties into Eld Inlet. Preliminary septic design is pre-approved. Electricity, cable internet/TV, and phone will need to be brought in from Overhulse Road NW. The driveway will likely begin near the corner of Sunset Beach Dr. NW and Overhulse Road NW, and will end with a fire truck turn-around loop. A water well is also needed. LOT 2 – 5.03 acres, $165,000. Possibly the most interesting home site, with a gentle slope that could lend itself to a multi-level house. The building site overlooks most of the lot, which falls away to the far northwest corner. The driveway would enter from near the corner of Sunset Beach Dr. NW and Overhulse Road NW. Preliminary septic design is pre-approved. Electricity, cable internet/TV, and phone will need to be brought in from Overhulse Rd. NW, as will a driveway. A water well is also needed. LOT 5 — 5.15 acres, $180,000. A corner lot with future driveway access to be from Overhulse Road NW and also a long frontage on 36th Ave. NW. Plenty of level home site area. The driveway will likely curve around the small seasonal pond that abuts Overhulse Road. 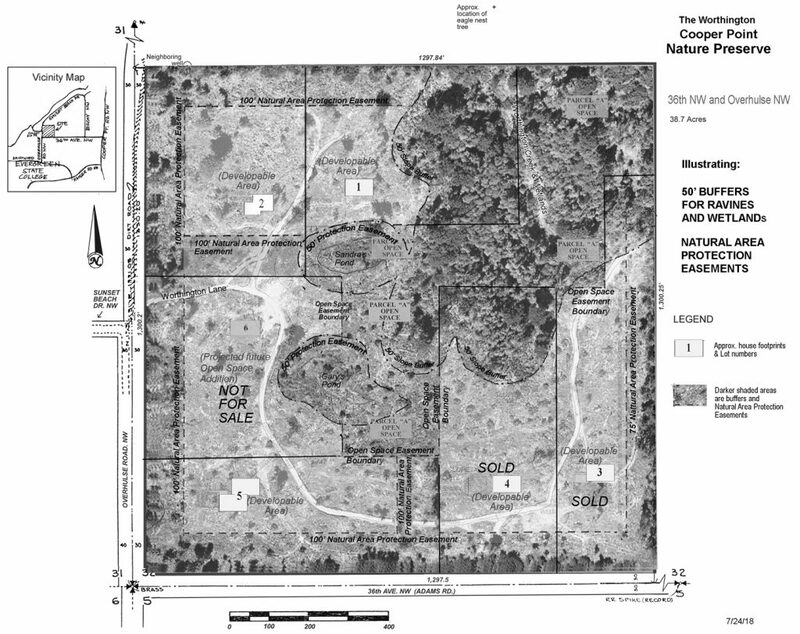 Preliminary septic design is pre-approved. Electricity, cable internet/TV, phone, and natural gas are available from 36th Ave. NW. A water well is also needed.